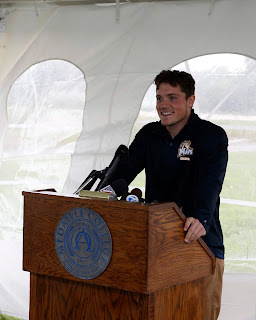 BUFFALO, N.Y -- Medaille College student athlete Matthew Gabalski of Elma (14059) was one of the speakers at a joint ceremonial groundbreaking event on September 10 to announce the new home for the Medaille Mavericks men's and women's soccer and lacrosse programs. The Medaille Sports Complex at Buffalo Color Park, located at 427 Elk Street in Buffalo, will include an outdoor athletic turf field, a 26,400 square foot indoor field house featuring locker rooms, an athletic training facility, weight rooms, meeting space and classrooms. Gabalski, a member of the men's soccer and lacrosse teams, was joined by more than 40 student athletes. "The Medaille Sports Complex is so much more than just a place to play," Gabalski told the crowd. "It's finally a place to call home." The event was held by Medaille and South Buffalo Development LLC.